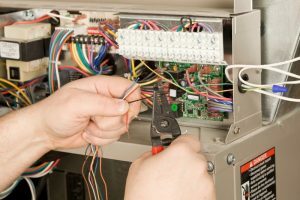 Furnace maintenance keeps your heater running smoothly while keeping you and your family members safe. It keeps your home safe by keeping carbon monoxide at bay. Carbon monoxide isn’t something that you always have to deal with when it comes to your furnace system, but it’s a problem that arises when things start to go wrong with your heating system. If you’re like the vast majority of homeowners, your furnace uses natural gas to power your system. That means that your furnace relies on a combustion process to provide your home with heat. As long as everything is fine with your furnace, you won’t run into any trouble, but if the furnace combustion process is incomplete, then you run the risk of carbon monoxide leaking in your home. Carbon monoxide is such a big problem because this gas is harmful to the human body. It causes side effects such as nausea, vomiting, fainting, and it can even result in death after long amounts of exposure. Carbon monoxide is such a danger because it’s colorless, odorless, and tasteless—you need a reliable monitor in your home to detect it. To avoid this problem altogether, it’s a great idea to schedule furnace maintenance services. So now you’re realizing just how essential your heating maintenance services are, however, you’re unsure of what team of technicians you want to choose to service your home. If you ask around or do your research, you know that Comfort Flow Heating has a great reputation here in Oregon and we didn’t garner this reputation by accident. We’re known for our quality service because we put so much effort into all the work we do. We’ve worked in the area since 1961 and the foundation of our brand has always been quality work backed by superior customer service. We ensure that all our team members are NATE-certified professionals who arrive ready to serve you. If you need superior service, make sure you contact our team today. If you’re ready to improve the quality of your furnace system, make sure that you schedule your furnace maintenance appointment with our team at Comfort Flow Heating. We’ve served Oregon for the past 40 years and we have the expertise to serve your team too.